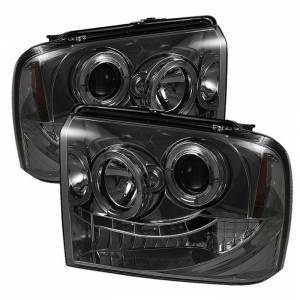 These Spyder® smoke halo projector LED headlights for your 2005-2007 Ford Super Duty truck feature projector beam headlights for a sharper, more focused beam of light as well as bright halos and custom housing for an exclusive, unique look. Every Spyder headlight undergoes a rigorous testing and quality control process before it leaves the factory. All wiring is tested to make sure the light is completely functional, and the housing is sealed with high quality silicone to ensure that no moisture can become trapped inside. Spyder lights are approved by the Society of Automotive Engineers (SAE), and ISO-9000 and ISO-9002 certified. They meet all U.S. Department of Transportation (DOT) regulations, and are compliant with Federal Motor Vehicle Safety Standard (FMVSS) 108. Spyder headlights are designed to exactly replace your factory lights; however some electrical wiring work may be required. Most lights come with detailed instructions to guide you through the installation. They're covered against defects in materials and workmanship for a period of 1 Year (If purchased after 3-1-2015) following the original purchase date.